Twelve months ago, Vimeo launched a new part of its video-sharing service called Vimeo On Demand where independent filmmakers could upload, share and sell their latest releases. To mark its first birthday, Vimeo is sprucing the place up a bit with a new storefront that makes it easier for viewers to discover new videos, watch preview trailers and either buy or rent access for those that appeal. The site itself sports a modern design, with featured titles positioned near the top and all-new ‘collections’ around specific themes such as ‘Patagonia Selects’, ‘Slamdance’ and ‘Oscilloscope Laboratories’. At the very bottom, there are also links to traditional film genres such as documentaries, animated features and horror flicks. Lastly, the updated platform gives viewers a personal library where they can find all the titles they’ve bought, rented or watched in the past. 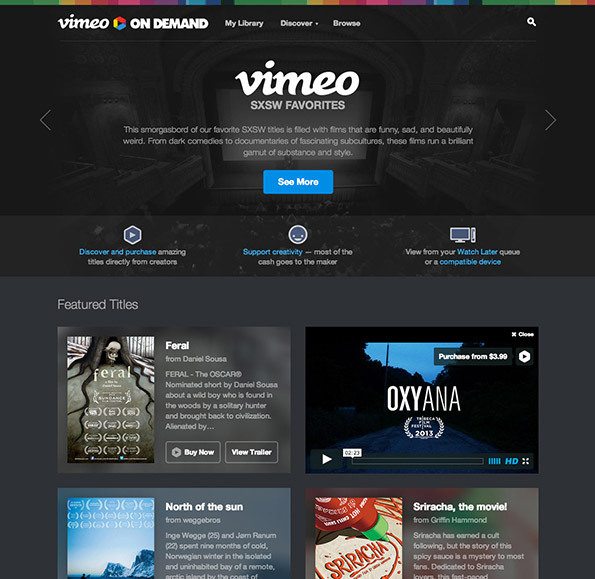 These changes should give Vimeo On Demand a clear, approachable design for newcomers. The company is also pouring in an extra $10 million to bring new independent films to the platform, so it’ll be interesting to see whether its investments pay off in the coming months.